Here’s the perfect way to safely keep your firearms at your fingertips – and, to keep them totally protected. 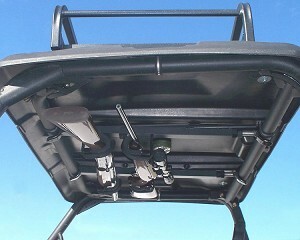 The Quick Draw Overhead Gun Rack holds two guns securely in the inside roof area of the UTV. The QD858-OGR fits 2013 Polaris Ranger 900 Only.